New Yankee Workshop - What have you made? I started this thread as a tribute to the New Yankee Workshop, which we have all seen, anywhere from once to every episode. Norm Abram has inspired us all, and is the reason a lot of us got into woodworking. Credit to becikeja who started another post “Norm is still the king” and gave me the idea to start this. 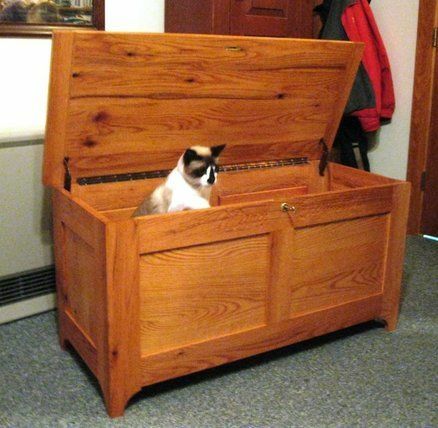 Share what New Yankee Workshop projects you have made, and Pics would be great. 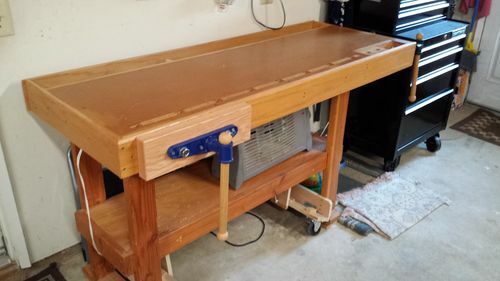 A sharpening bench/cart (with mods) that is nearing completion. Adirondacks (w/mods), book cases and a couple more. Still projects I want to try. Okay great idea. Although this was not made from the “Measured Draring” it is essentially Norm’s clamp cart. 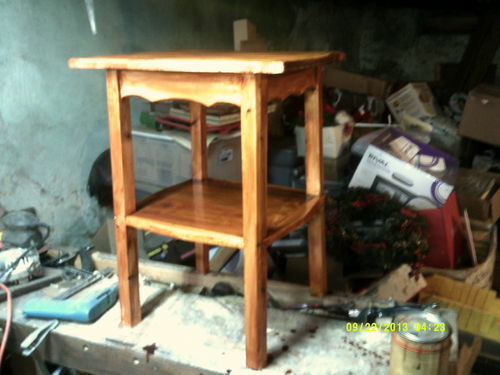 Built with 2x lumber and pocket screws and 1 in poplar dowels. Very functional. 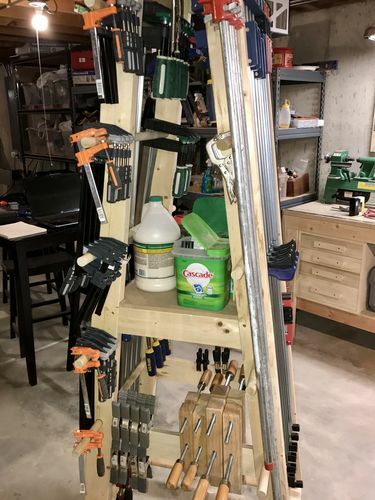 I built his router table (Version 1, though my changes looked more like version 2), his clamp rack, and on deck is a library desk. Seems like there is one other item, but I can’t remember what it was. 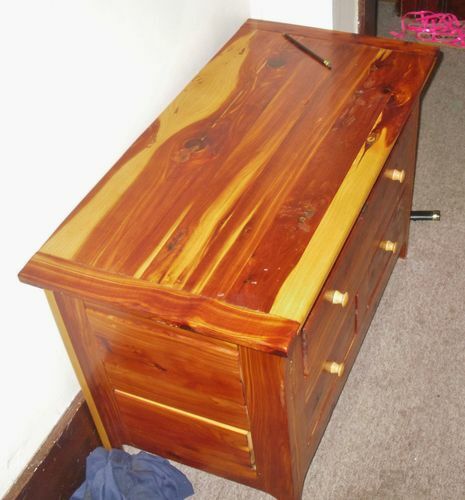 Second chest of drawers I ever built was made like Norms. I used his projects as ideas. I forgot that I also made his Table Saw Station. I can only find 1 really bad picture of it, it has been gone for about 15 years. it was very useful to enhance the capabilities of a benchtop saw. I do still have, and use the Saw Horses though. 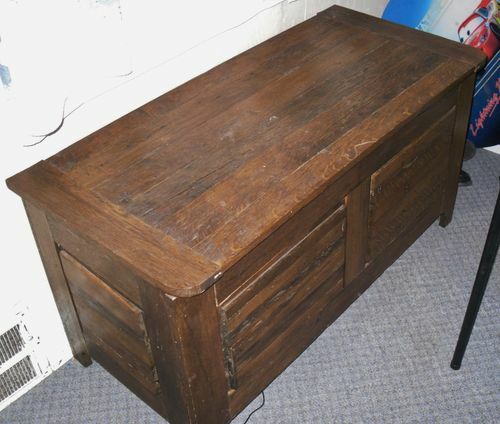 I made this blanket chest from his plans (published in a project book), accept I used Red Oak and put my daughter’s name on the top rail. I’m currently making a second one out of Mahogany with raised panel construction. Nice work, guys! 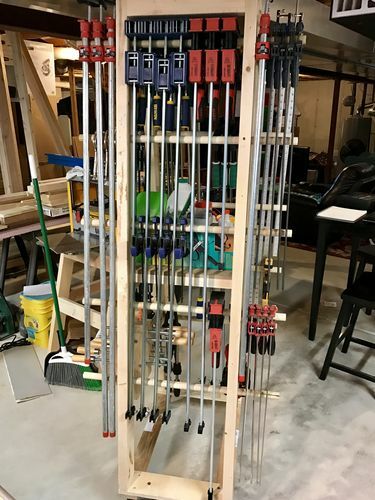 Love that clamp rack, Ben. Wish I had that collection in my shop! Though I’ve never made any of Norm’s projects per se, I have watched many of his videos and used the techniques he demonstrated to help me solve my own problems or add features and ideas that he employed for my own. I remember the other thing from his plans that I built. 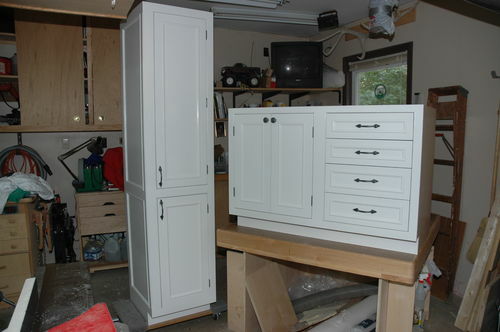 He spent one season doing a kitchen, the cabinet construction was the focus. That season also had a partner article in FWW that went into a little more detail about the cabinets, particularly the door panels and applied molding. I built bath cabinets that closely followed his design, except , of course, they were for a bath. 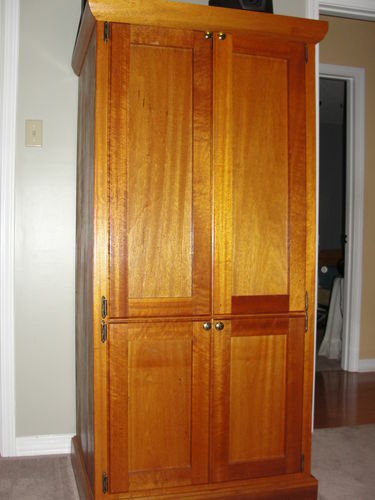 A vanity and a linen closet (pantry). It was also the first painted project I had ever attempted. I’ve made a few of his projects. 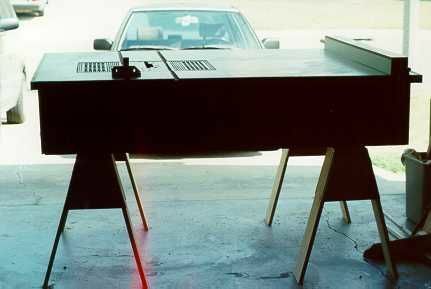 First I made his “ice box entertainment center”. 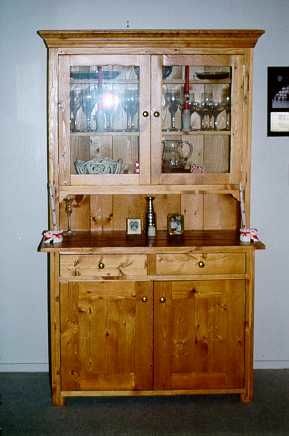 I made it out of mahogany plywood and solid mahogany about 25 years ago. 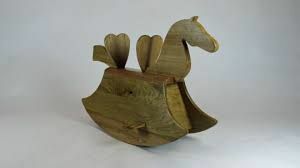 Next I built the “Sturbridge Village rocking horse” which I somehow could not find in the house. I think my wife took it to school or hid it somewhere… but it looks something like this. I made it for my oldest daughter for her 2nd birthday. She’s now 27! 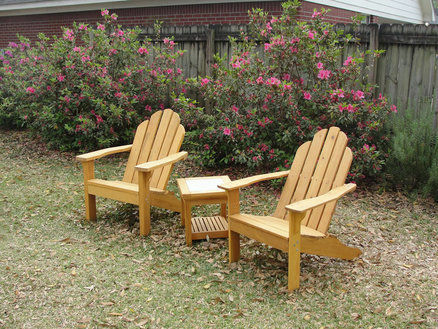 Next was the “Adirondack chairs”. 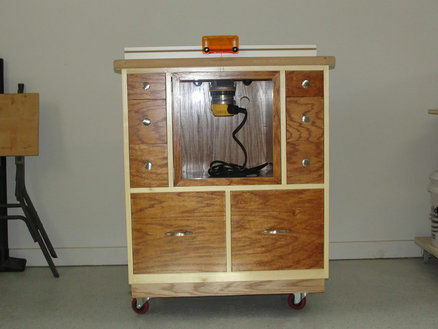 Last was the “router table” with a purchased table. I’ve had this a bout 20 years I guess and I still use it. I recently added a vise to it and now I like it more than ever. I made the Adirondack chairs out of one by cedar (couldn’t get 5/4 cedar from a brewery like he did) I added some diagonal bracing on the back as the chairs started getting wobbly sideways-wise, painted them and moved them to the covered porch but have had them since about 1993. Quite comfortable. I built the shaker candle stand (posted in my projects). I also built some wall cabinets as bookshelves (wanted to keep them out of kiddo’s reach) based on his garage workshop episodes. My first furniture project (not posted here) was the shaker side table. Never even built the drawer. It now sits next to my computer desk to hold my printer…and to remind me why I’ll never buy “select pine” from the big box stores again! Also, in process, 2 bookshelves from his first or second season for a friend (building them together).